Klang, 24 January 2019 – Some say, to ring in the new year with a bang, a new hairdo (bangs or no bangs) is essential. Especially when Chinese New Year happens to be just around the corner. 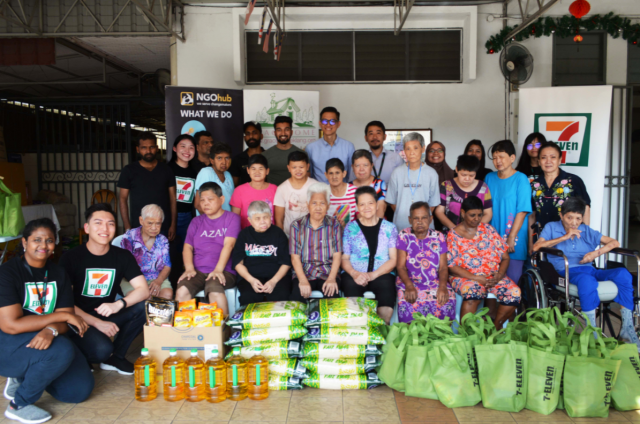 With this in mind, 7-Eleven Malaysia recently travelled to Klang to kick start the new year together with the ladies of Grace Home Klang, where they were pampered with brand new haircuts and other goodies. Grace Home Klang was founded by Dr. Hendy K.Pillai through an opportunity to start the home with 5 elderly destitute women from China who needed a shelter for themselves. Since then, the home has taken in over 1,500 underprivileged women, some of whom are widowed or suffered from domestic violence referred directly by the Welfare Department. Currently, the home shelters 27 women, several whom are disabled. With the help of volunteers from NGOhub, the residents were gathered around as hairdressers gave each of them their haircuts. The volunteers took the opportunity to get to know the ladies who were waiting their turn before cleaning up after the haircut session. To add to the celebration, 7-Eleven Malaysia brought goodie bags to be handed out alongside provisions such as rice, oil and many more. The joyful folks at Grace Home Klang entertained the volunteers with performances of oldies from the 60s before bidding farewell. In a conversation, Amy, the home care assistant shared, “The ladies always welcome much-needed company and encouragement from the community as it makes them feel appreciated and happy in spite of the struggles they have faced. The sponsorship of provisions and manpower would also be of great help to lift some weight off their shoulders. “7-Eleven Malaysia always strive to reach out to the underprivileged and less fortunate community. We hope that our initiative inspire the public to volunteer at nursing homes or any other shelters for the less fortunate, especially during the festive period when one would especially be reminded of the warmth and joy of family. 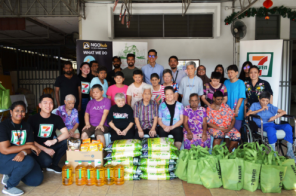 This was a great way to start off the new year, especially for wonderful ladies of Grace Home Klang, just in time for the fast approaching Chinese New Year,” said Ronan Lee, 7-Eleven Malaysia’s General Manager of Marketing.